Our view from lunch on Chaweng Beach. Did I mention that it’s a beautiful beach? Remarkably, this is our sixth pass through Thailand in the two years we’ve been on the road. In part that’s a function of Bangkok being a transportation hub, with Thai Airlines being pretty flexible for us to use our United miles on. 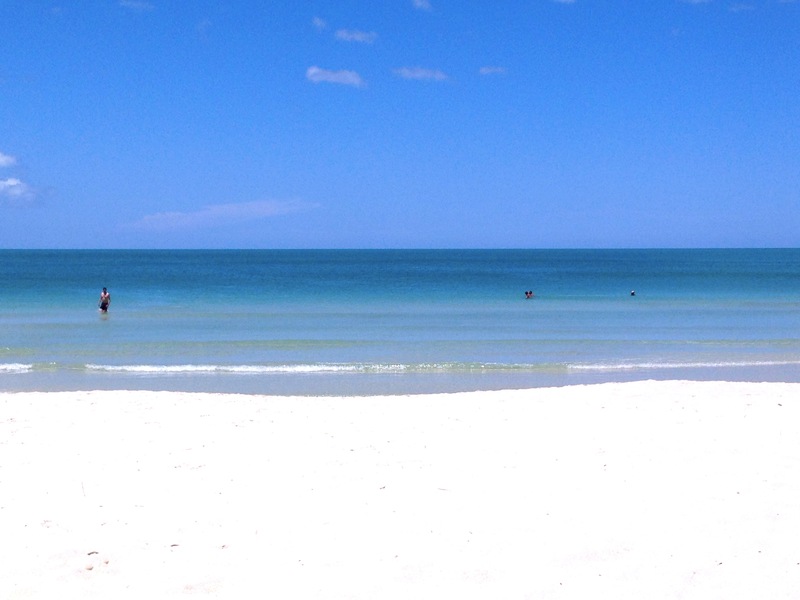 Beyond that, though, we love the heat, the tropical feel, the beaches, and the food. Especially the food. And while often they tone the heat down for us Westerners, sometimes it comes piping hot like the Thais eat it. Turns out that’s great for my diet since I just can’t eat too much when it’s that hot! 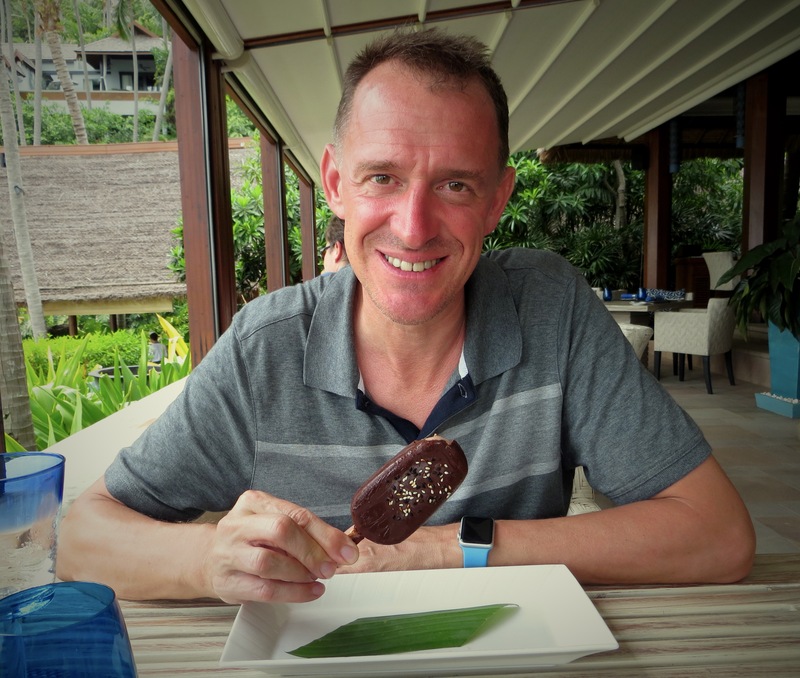 Enjoying a chocolate ice cream bar for Mark’s birthday lunch. This was no ordinary dessert, though – this was the end of a fabulous meal at the Four Seasons Resort on the northern tip of the island! Mark’s birthday dinner at a great French restaurant, with real French owners and a French menu. And a Pastis to celebrate with. At any rate, the second we stepped off the plane in Koh Samui we were struck by the intense midday heat and the heavy, humid tropical air. I’d sort of forgotten that since we got to Saigon in mid February, we’ve essentially been traveling through spring weather, sometimes a little warmer, sometimes cooler, but always pretty temperate. Not so here: there is no spring in the Gulf of Thailand. There’s sun and rain, and we had a fair amount of both. The rain, though, this time of year at least, comes in intense but relatively short bursts so even on a day with heavy rain you get plenty of sun. 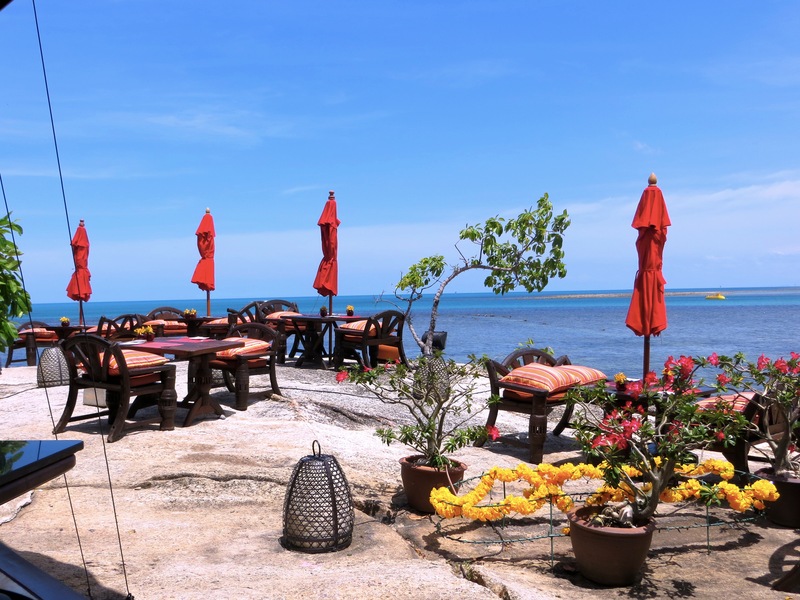 We first came to Koh Samui in January 2014 and, as countless tourists before us, found it to be a spectacularly beautiful island. 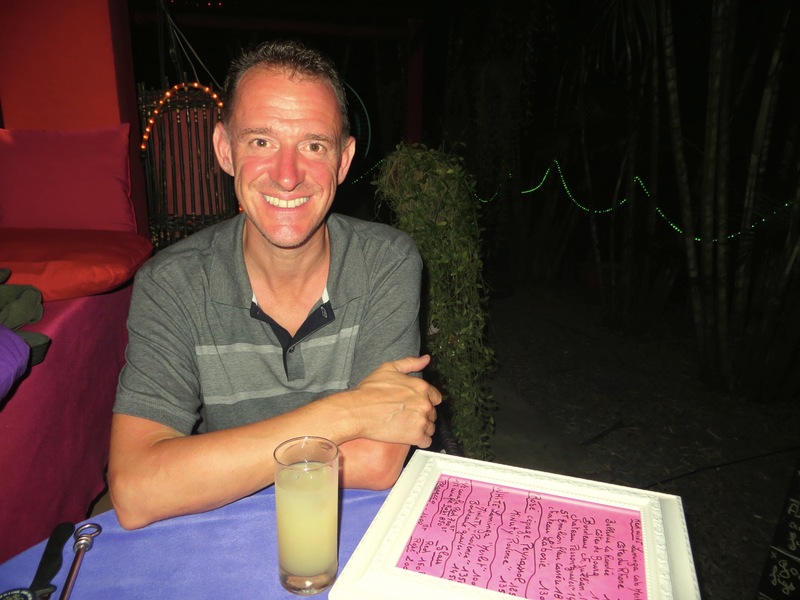 So, as we were looking for a place to lay back, rest Mark’s knee, and celebrate his 50th birthday, Koh Samui leapt to mind. And after nine days here we’re confident it was a good choice. 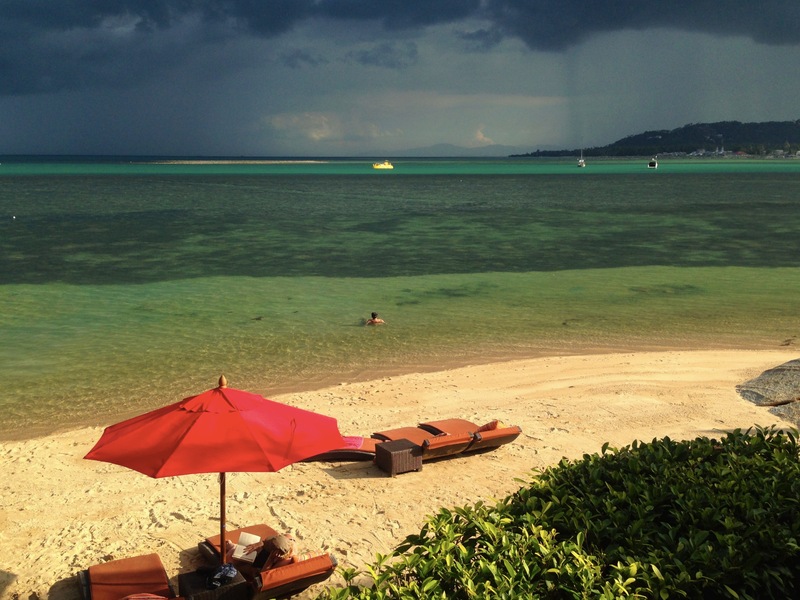 What do you do for nine days on Koh Samui? Not a lot, to be honest. The first four days we splurged at the W Resort on the north coast of the island, celebrating Mark’s birthday. It was a bit of a strange experience insofar as we weren’t really that crazy about the resort as a whole or the beach there, but we loved our villa with great views of the Gulf. So you rent scooters and go out for lunch at Fisherman’s Village, maybe go back there for dinner, but mostly just hang around the pool and read. Very luxurious. Then we headed south down the island to Rocky’s, a beautiful but much more affordable resort near Lamai Beach. We found this just a lot more comfortable, friendlier, more accessible. The woman who did the design obviously has a great eye and great attention to detail; it was a place where you were always noticing another beautiful touch. And speaking of nice touches, once a week the management at Rocky’s sponsors a one-hour cocktail party, giving guests a chance to mingle and chat and, of course, drink. We met a bunch of fun Brits on the island for a wedding. The only slight disadvantage to Rocky’s is that, like the W, it didn’t have a very nice beach. Or, more specifically, the beach was nice but the swimming was all but impossible; very shallow for a long time and lots and lots of rocks (thus the name of the resort!). There’s an easy solution to a problem like that, though: rent scooters and head to Chaweng Beach, just a little north. This was where the backpacker set “discovered” Samui back in the 1970s and while it’s grown up a lot since then – until 1970 there were no roads on the island at all – the beach itself is still spectacular. We’d spent lazy afternoons when we were here a year ago, and after trying some of the other places on the island we decided it really was perfect for us. One of the great things about returning to a place like this, and having great records of where we ate and all that, is that we could go back to the same place on the beach with spectacular beach chairs that they rent out for about $6.25 a day, per person. 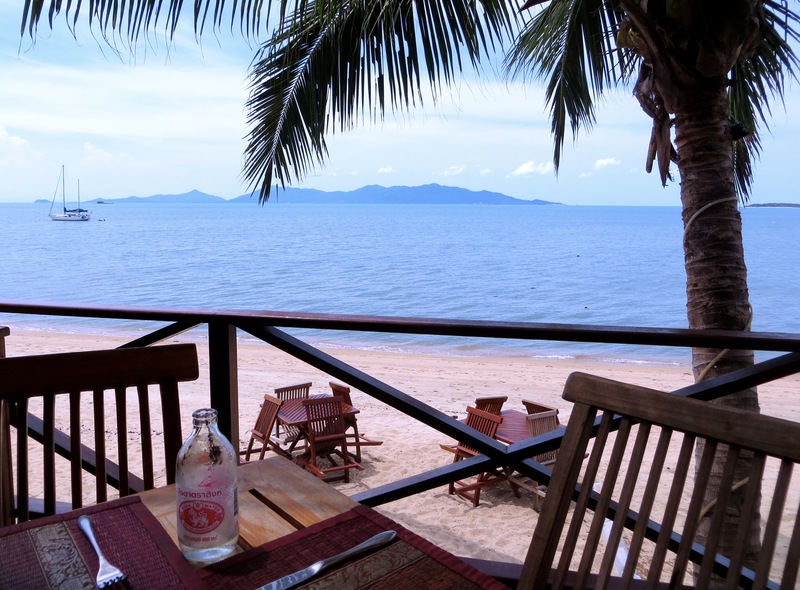 It’s a beach restaurant called “Eat Sense,” which really doesn’t make sense but we loved their slogan: “A perfect combination of good and delicious.” (If “Eat Sense” sounds like an odd name, our favorite restaurant in Fisherman’s Village was called “Starfish & Coffee.” Weird.) At any rate, Eat Sense has big, comfy chairs and big umbrellas to sit under. So the last two days, finally, we were back in bliss. My view of the Gulf of Thailand from the beach chair on Chaweng Beach. It doesn’t get much better. And that’s pretty much it. Mark turned 50 and finished his massive Ken Follett trilogy. I worked through a history of the fall of the Ottoman Empire and did a lot of running. We had some great meals and watched a few great rainstorms. And we relearned a lesson we (should) know well: location, location, location. 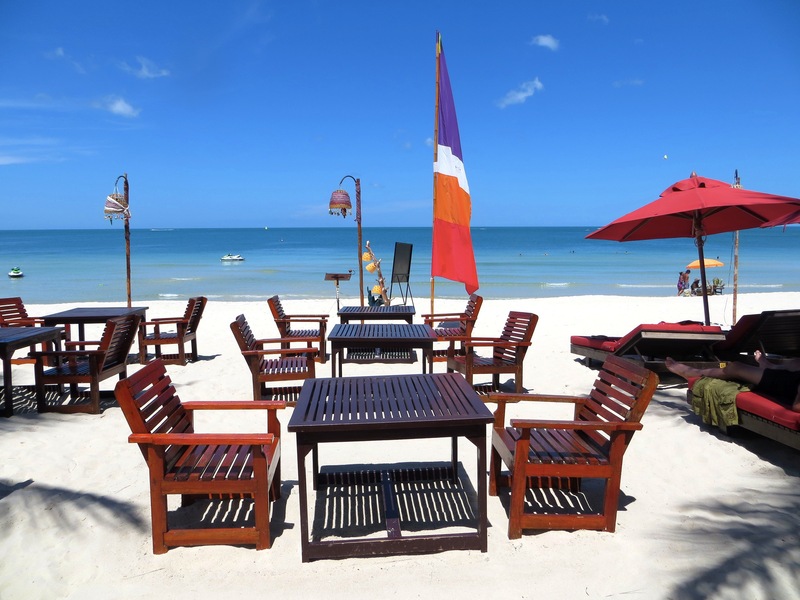 We’ve stayed at three different resorts on Koh Samui, now, all of them a bit distant from the best beach on the island because we liked the look of the resort. Next time we come here – and there will be a next time – we’ll probably stay in Chaweng, since it is one of the most beautiful beaches we’ve ever found. Next stop, Bangkok, and then off to Bhutan! The beach at Rocky’s. The day had been beautiful and sunny until about 4:30, when this blew in. Unfortunately, the Brits’ wedding started at 4:30, too. Still, it passed and apparently the wedding was fine. 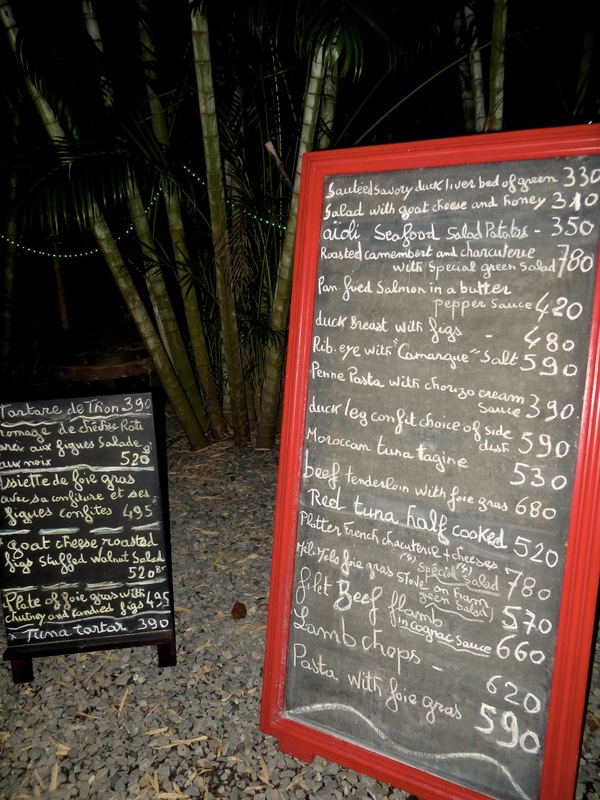 And finally, just so Mark will remember his 50th birthday, this was the menu. Tuna tartare, foie gras, duck confit. Very low key, very French, and great food. If you ever get to Koh Samui, it’s worth a night. 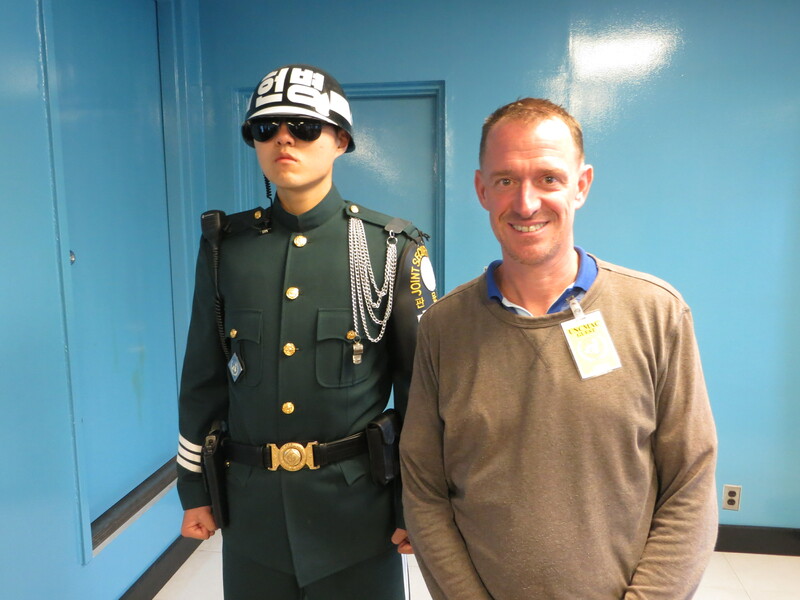 Mark posing with a South Korean soldier … in North Korea! Korea turned out to be a shorter diversion than we’d expected. Even just a couple weeks ago, when we started planning this, we figured Mark’s knee would be in good shape to hike by this point and there is supposed to be great hiking on Jeju-do, South Korea’s southernmost major island. Alas, that recovery is still lagging so instead of pushing things we headed back to Seoul to do a little more urban sight seeing (really to see if we’d missed something explaining why it’s supposedly such a design destination). 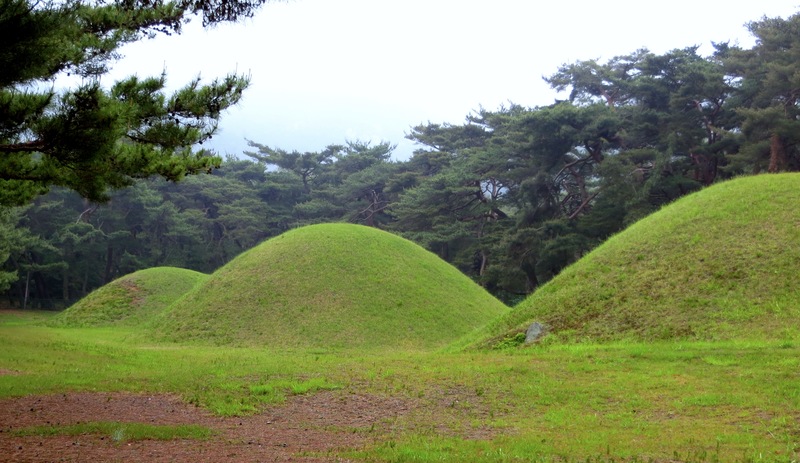 Some of the tumuli in and around Gyeongju. They’re everywhere and oddly amusing. 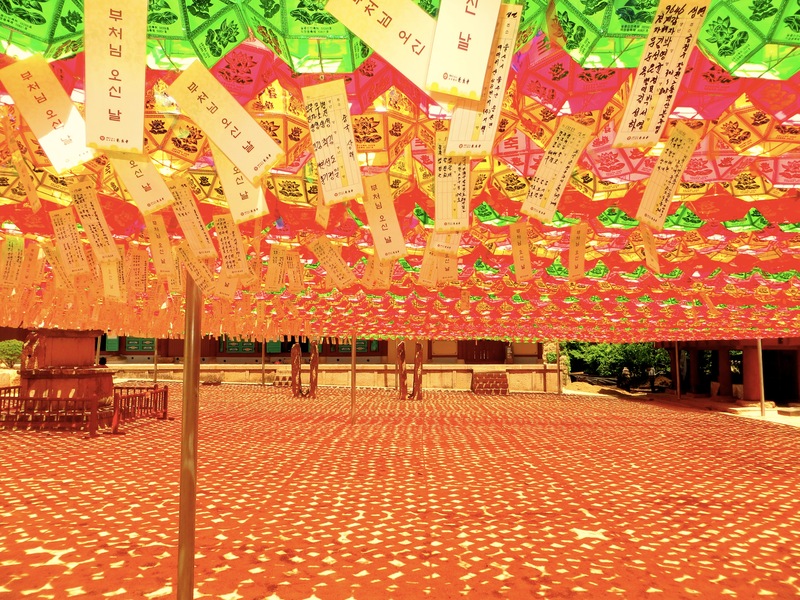 This is Cheomseongdae, the Far East’s oldest astrological observatory. 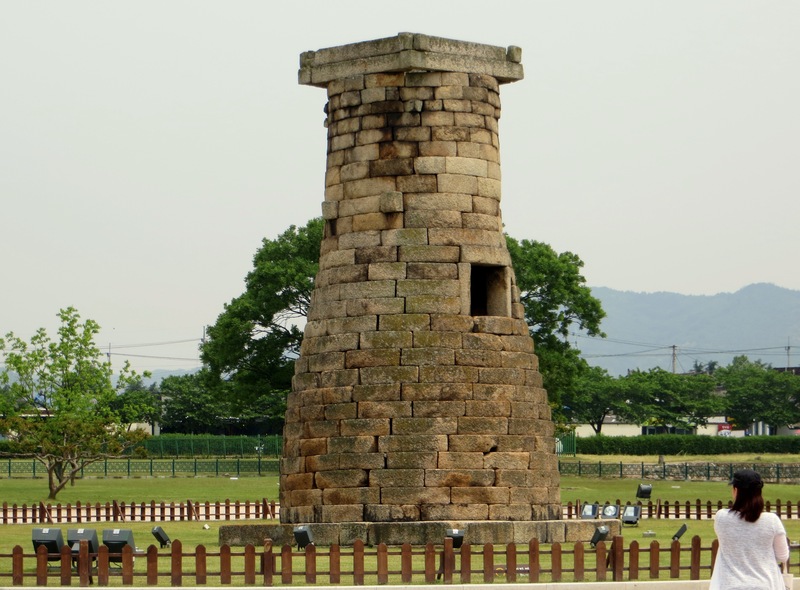 Built in the 7th century, it’s surprisingly sophisticated: the twelve stones at its base represent the months, while the 30 layers reflect the number of days in a month and the 366 stones used in its construction reflect the number of days in a Shilla year. Apparently there are other details relating to stars and all that. Still, it was hard to see how this reasonably short structure could work as an observatory. First, though, we did a three-day stop in Gyeongju, a little north of Busan and described as a “museum without walls.” Back in 57 B.C., when Julius Ceasar was making his name in Gaul, Gyeongju became the capital of the Shilla dynasty and remained the capital for nearly a thousand years as the dynasty was the first to conquer the entire Korean peninsula. Today the city is far smaller than the million people who lived there at its peak, but it has tons of historic attractions. The most distinctive of these are the mounds, round grassy tombs called tumuli, all over the city and outlying areas. They’re all tombs of monarchs, their families, and other important people. Most (all?) of them have been excavated and relieved of their riches, but the mounds still remain. 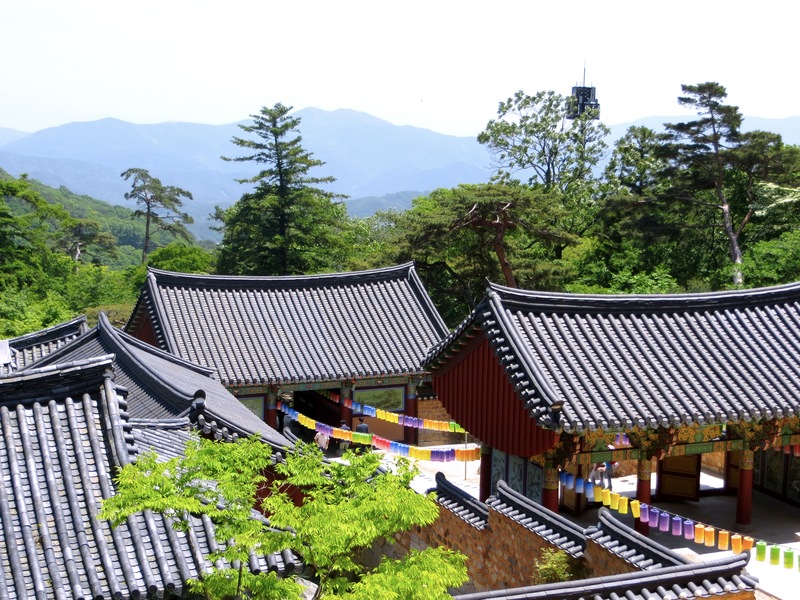 The biggest attraction in the area, several miles outside of town, is the Buddhist temple called Bulguk-sa, a UNESCO World Cultural Heritage site called “the crowning glory of Shilla architecture.” No question about it, it’s a beautiful retreat with gorgeous buildings. Mark & I were curious, though, about just how old the buildings we saw were. 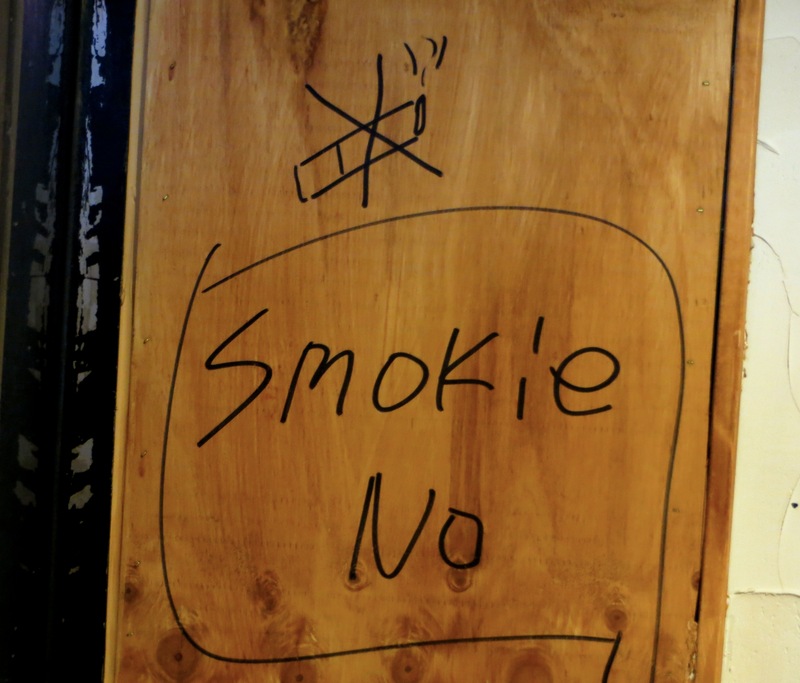 I mean, how long can wood buildings and especially the paint on them last? Turns out most of the buildings are restorations of the long-since destroyed originals. After this little stopover it was back on a bullet train to Seoul. After our second stop in the city I’m still struggling to figure out what to make of it. I’d expected great design and architecture and, with a couple exceptions, didn’t find it. In fact, we went out of or way to go to the Dongdaemun Design Plaza and Park, completed in 2013 as a showcase to Korean design. Wow, was I not impressed. It struck me as a bad hangover from 1970s and 1980s ugly urban renewal, something that will have to be torn down in 10 years to save the neighborhood. Still, there is something fascinating and alive – intense – in the city. With 10.5 million people living there, it’s bigger than Michigan. Yeah, imagine taking everyone in Michigan and putting them in less than 250 square miles and you’re going to get something interesting going on. 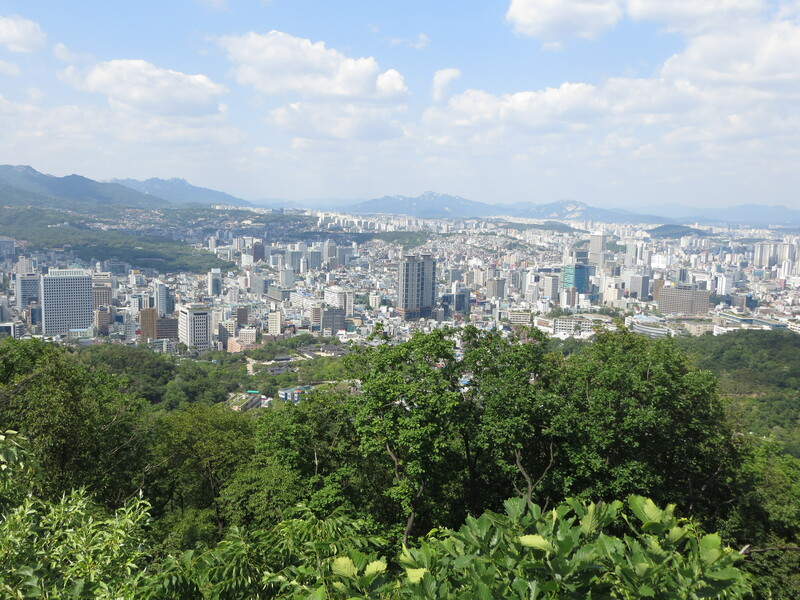 I spent one of our days on a huge walk across part of the city (something over 15 miles) and back up Namsan Park for a clear-day view of the megapolis and was just so urban, so big. 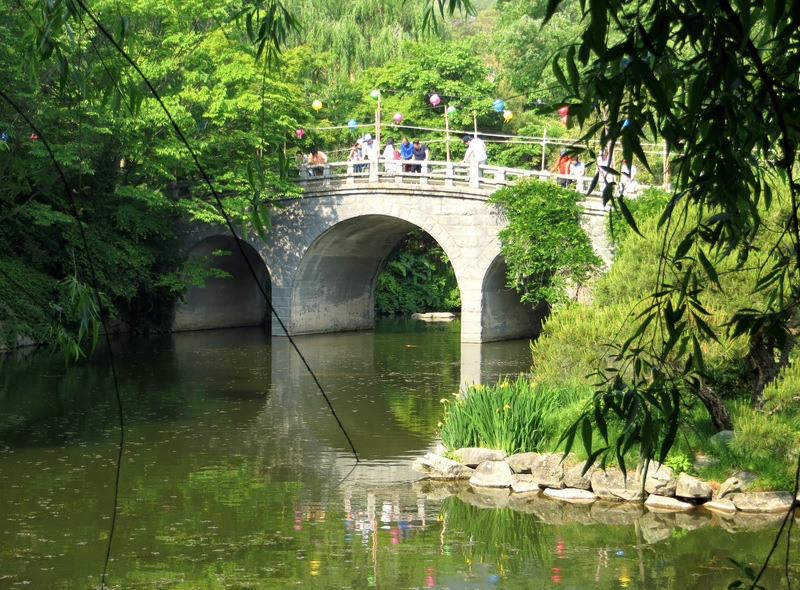 I have a feeling that if I had a few weeks to spend in Seoul I’d come to love it, but I’ll admit I’m not there yet. The DMZ portion of the tour was interesting enough; you got to tour one of the tunnels the North built to try to infiltrate its troops into the South and an observatory area where you can look through powerful binoculars into the North. 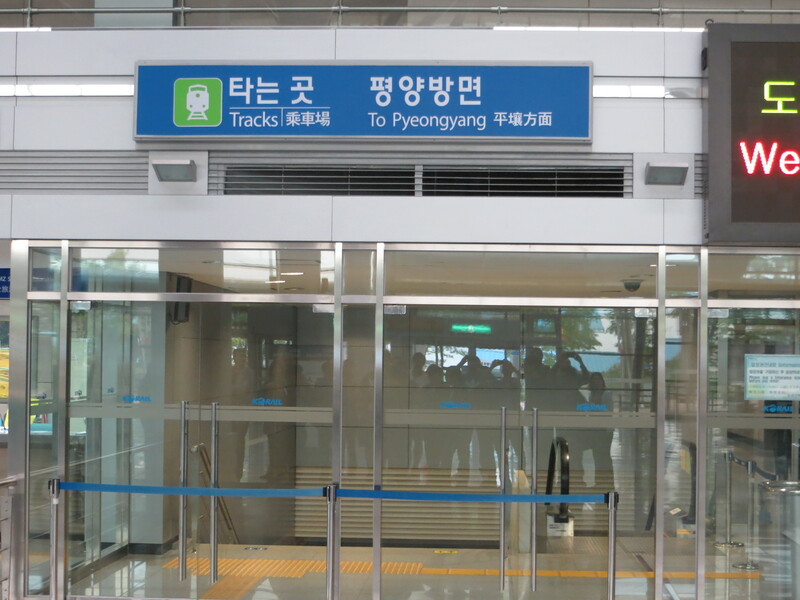 And we went to a train station built a few years ago in an era of optimism to handle high-speed trains between Seoul and Pyongyang, the North Korean capital. Everything is set to go for better relations, if not unification, except for the absence of train tracks and permission from the North to start building. Except for that, though, the train station is ready to go. 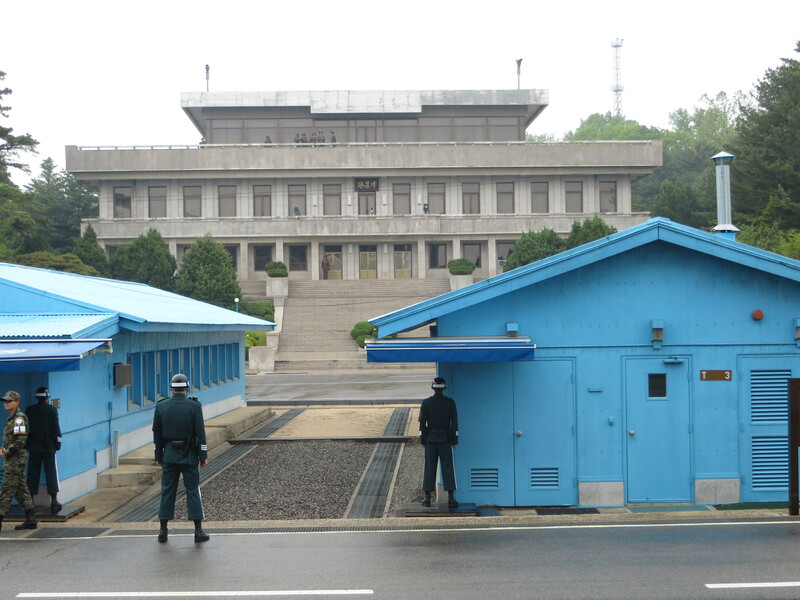 The Joint Security Area at the border between North & South Korea. These are South Korean soldiers, with the sentry standing half exposed and half hidden, to minimize the amount of target he exposes to the North. The building in the background is in North Korea, with high-ranking military officials on the upper balcony watching us (or, more likely, watching the military people all around us). 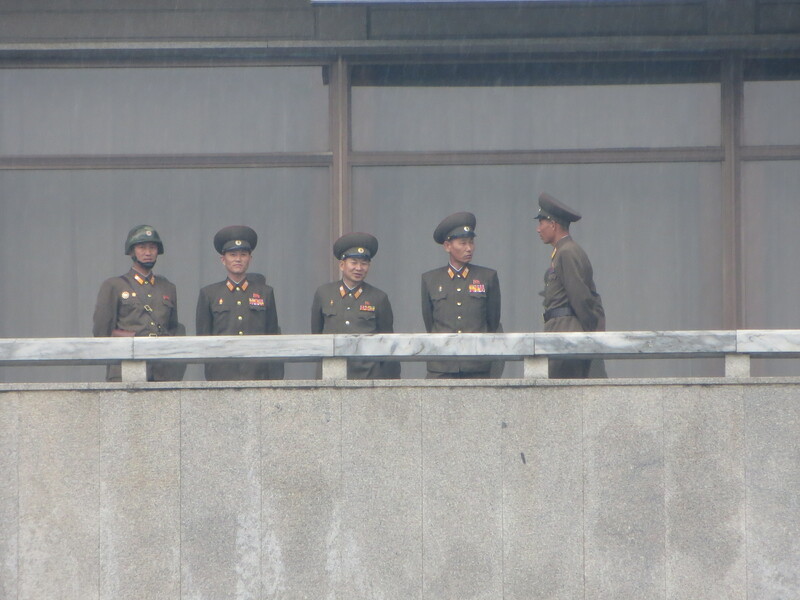 A close up of the North Korean brass watching us. You wonder what they think of the Defense Minister having recently been executed for falling asleep. The real excitement though was the trip to the Joint Security Area, an area built in Panmunjeom for the peace talks after the 1953 armistice. There are guards there at full alert just a couple yards from the formal border. Across the way you can see North Korean troops standing on alert lest the South Koreans get too frisky or something. The totally cool part of the tour is that you’re allowed into building that straddles the border, apparently set up for meetings. And then you can walk a couple yards into North Korean territory. How cool is that? Mark & I both just kept grinning: We’re in North Korea! Absent a more serious opportunity, though, we won’t count it as one of the countries we’ve actually been to. So now it’s off to Koh Samui, Thailand for some serious beach time and a little celebration for Mark’s 50th birthday. 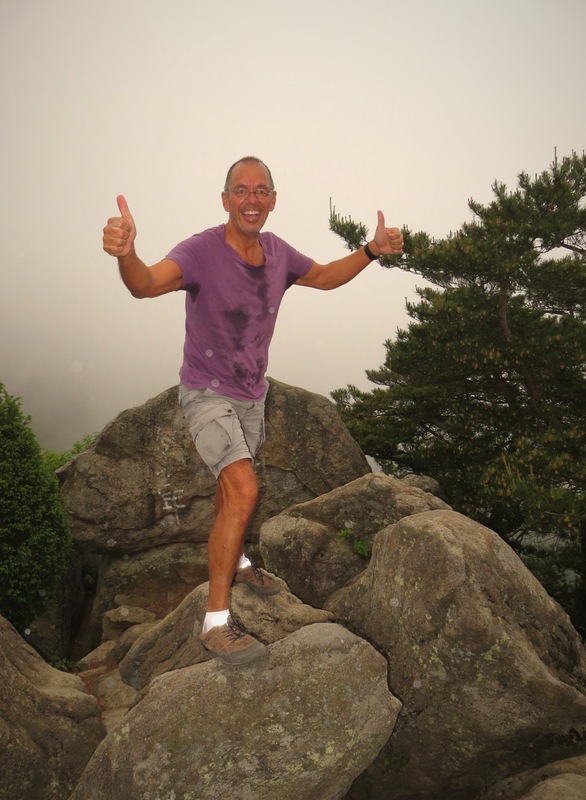 Bill (the friend we were traveling with in Korea) and I did a big hike one morning up a peak with great views of Gyeongju. The hike was great, but you can see the fog at the top. No views today! 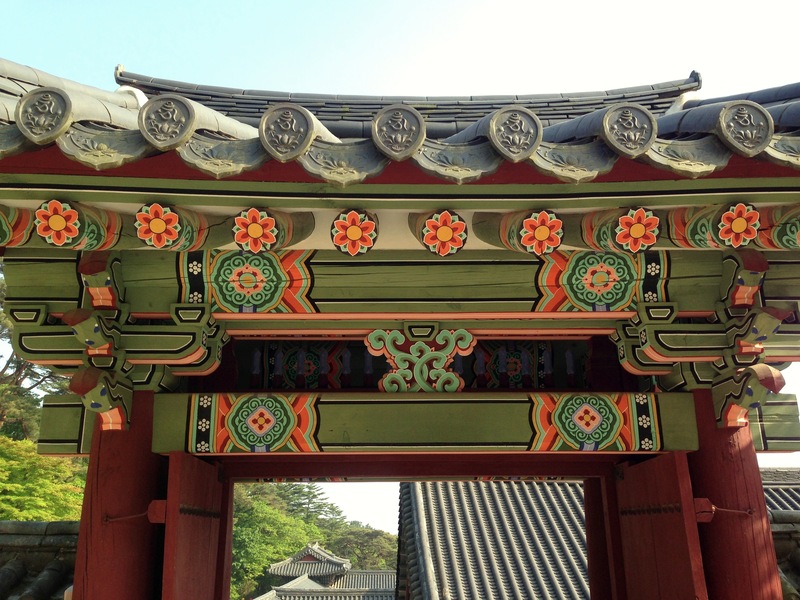 And then there were these beauties Mark discovered in Gyeongju. 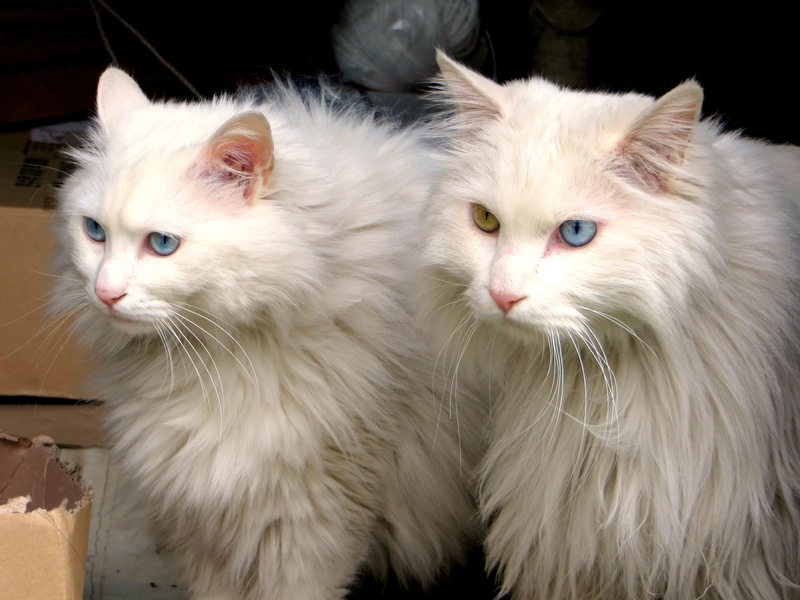 Notice that they both have one blue eye and one green eye. This is bulgogi, a traditional Korean dish. 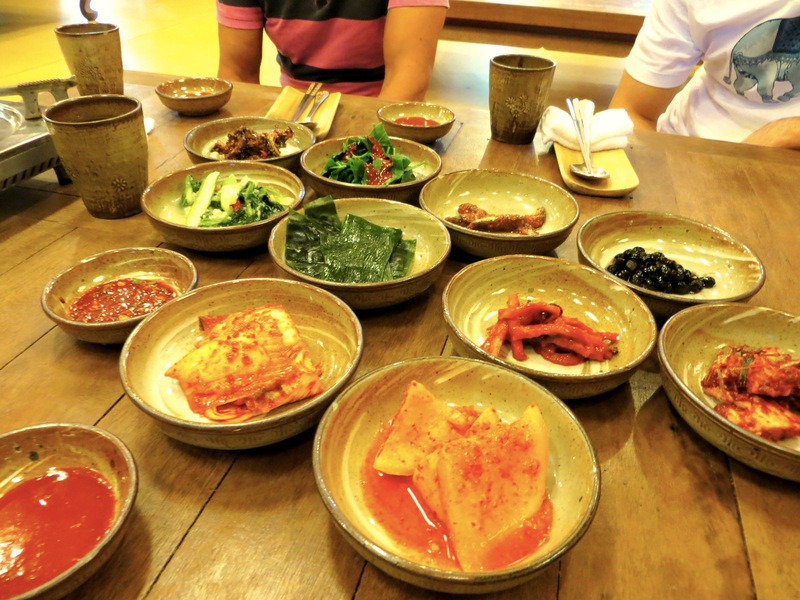 Many places served lots of side dishes with it, but this place had over 30 side dishes. Amazing and unforgettable. The train station all ready to go to Pyongyang. Except the tracks, but otherwise ready to go. 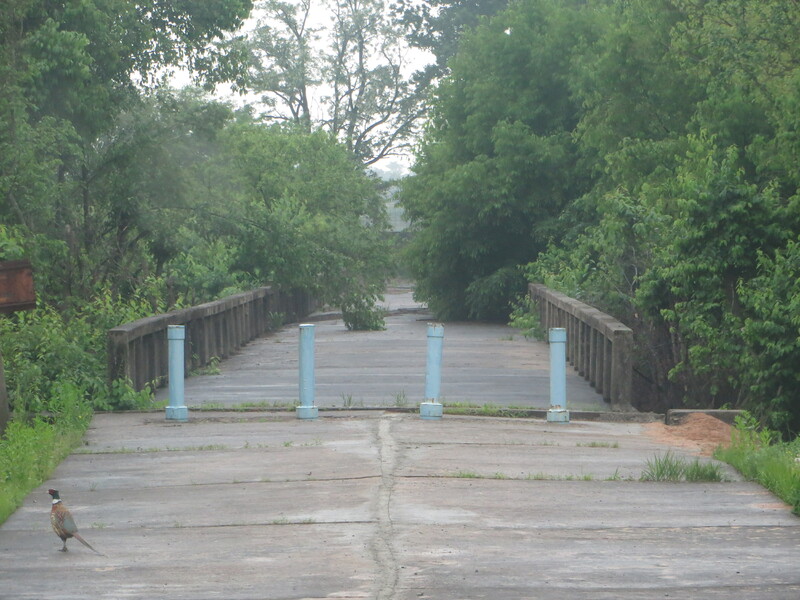 The bridge in the DMZ over which returning POWs crossed back to the South. 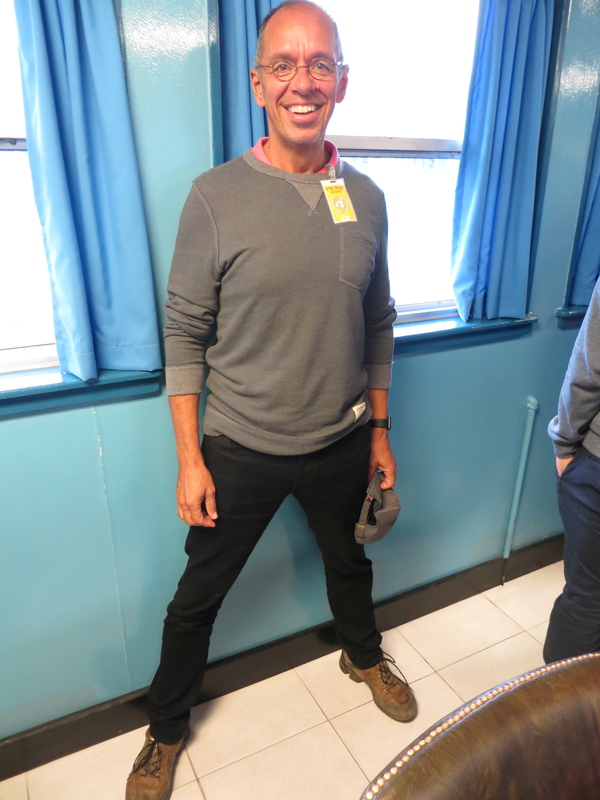 Here I am in the Joint Security Area straddling the border. My left foot is in South Korea, my right foot in the North. 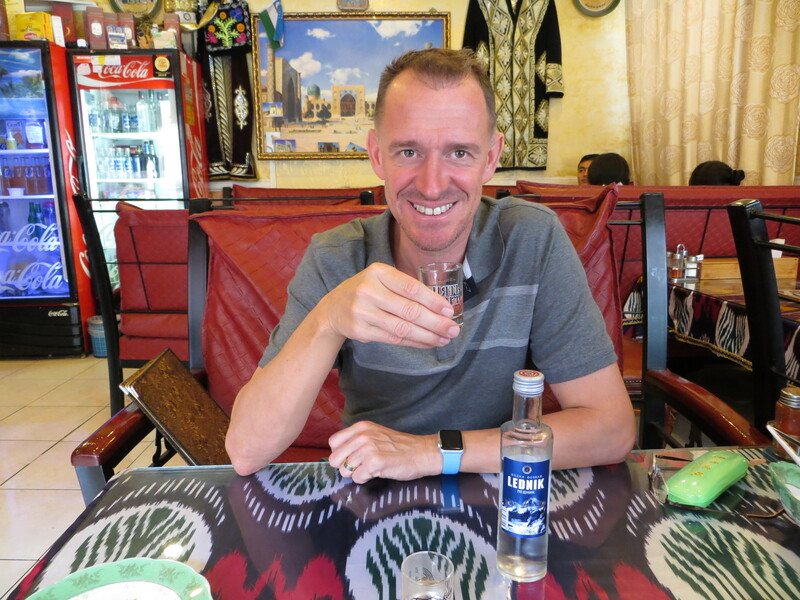 While in Seoul we stumbled onto a little Russian enclave and ended up having lunch at a great little Uzbek restaurant. Meals from that part of the world require vodka so we complied. 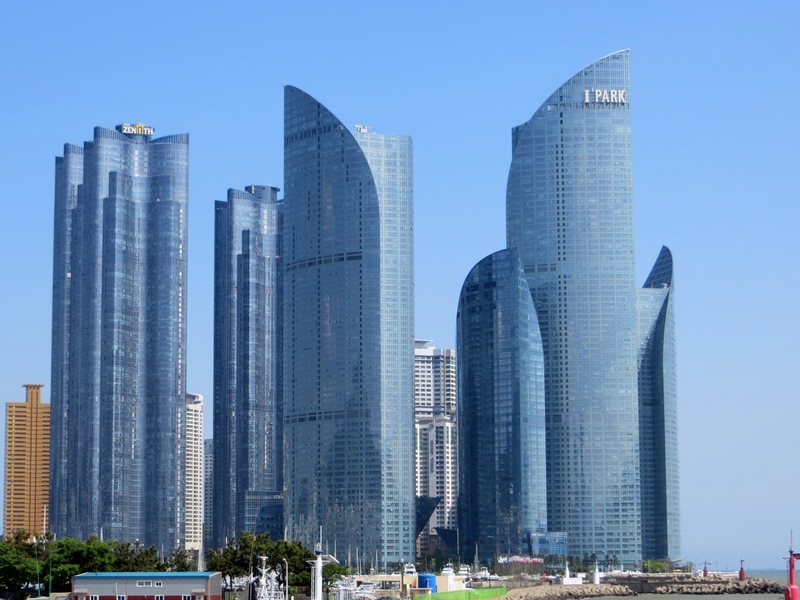 This is the brilliant Haeundae I’Park, not far from our hotel. The tallest tower is 80 stories, while one of the other towers includes the Park Hyatt hotel. 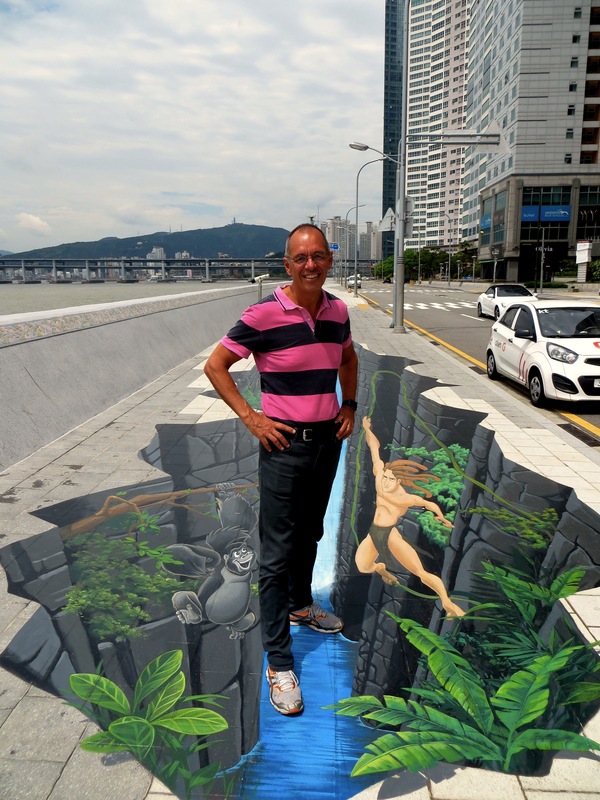 We expected to see this kind of striking design in Seoul, but found it in Busan. 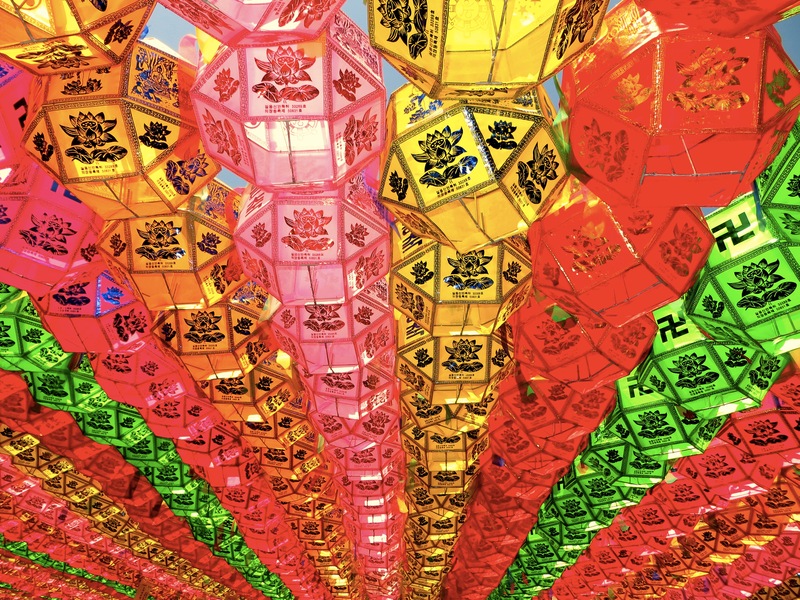 From Seoul in South Korea’s northeast we took a high-speed train to Busan, the country’s second city and one of the world’s largest ports, in the country’s southwest. It’s great being in a place that’s small enough and where the rail infrastructure is so good you can get across the country in just a couple of hours. I’d read of Busan (then known as Pusan) from it’s role in the Korean War. In 1950, when the North steamrolled over Seoul and essentially all the rest of the country, Gen. MacArthur and his troops made their final stand on the Pusan Perimeter. The line held – unlike other lines the U.S. troops had tried to establish, allowing MacArthur to land troops behind the North Korean lines at Incheon, thus dramatically altering the course of the war. Until, of course, he pushed too far north and fortunes were reversed again. But that’s another story. 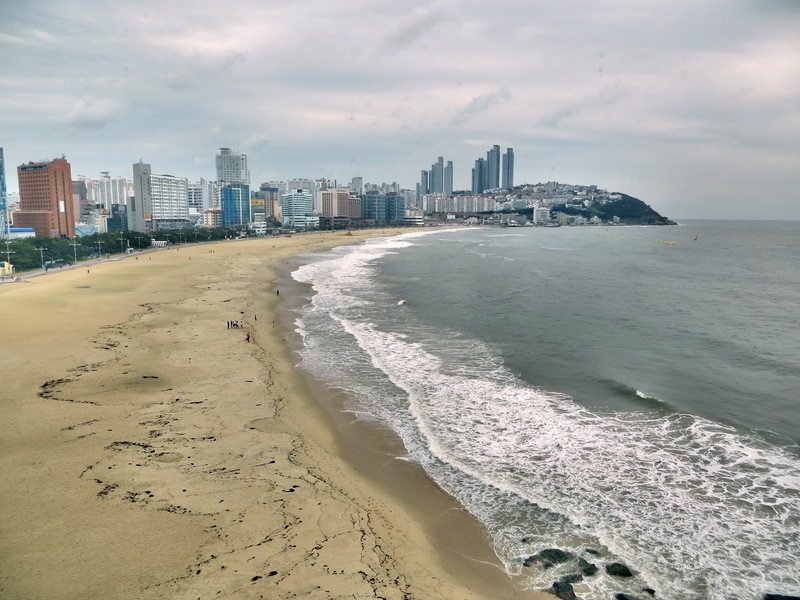 We loved Busan, and my only regret is that we only had four days to enjoy it. We had some great food, saw some brilliant architecture, stumbled into a red light district (! ), and had a great room with a great view of the South Korea’s best beach. 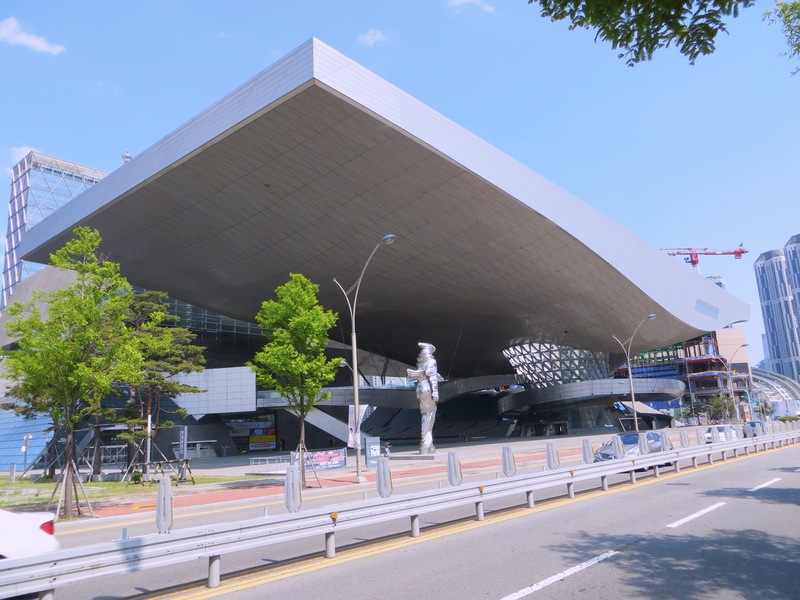 Another architectural wonder is the Busan Cinema Center, home to the Busan International Film Festival. The building here has the world’s largest cantilever roof, as certified by no less an authority than the Guinness Book of World Records. Now I don’t know exactly what a cantilever roof is, but it has something to do with the enormous distance between the end of the roof and the center structure supposedly holding the whole thing up. Busan plays up its desire to be seen as an international film center. Here I am standing in a big cave with Tarzan. Weird. This was the view from our hotel room; as you can see we were right on the beach. The weather cleared up brilliantly after this first-day picture, but it was still not quite beach season. Still, the view made the room a great place to hang out, especially for Mark as he continues to take it easy and spend lots of time icing his recovering knee. 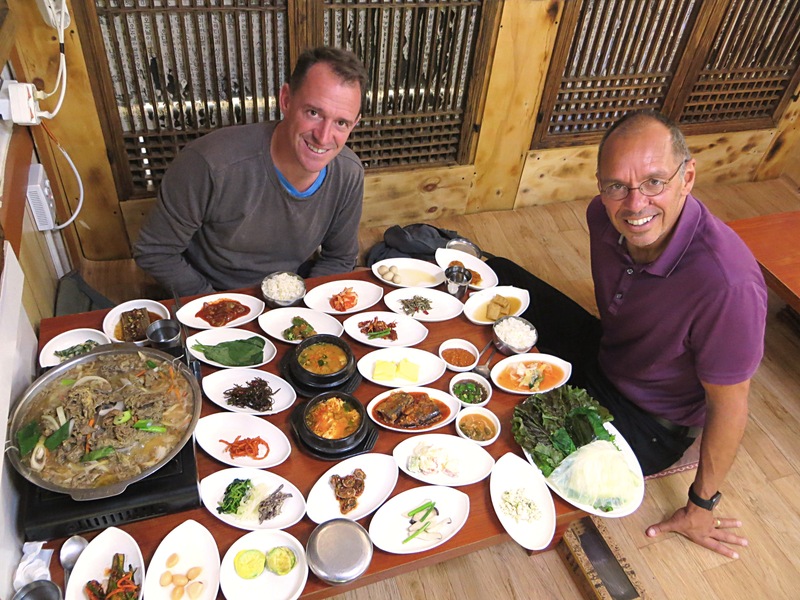 We have definitely been getting into Korean food. We don’t exactly understand it or know what to expect, but in most cases you order … something … and they bring many, many small dishes to go with it. It’s spicy and sometimes a little weird tasting, but it’s been pretty good so far. A highlight was our journey to Beomeo-sa, a Buddhist temple nestled in the mountains north of the main part of the city. Getting there consisted of a subway ride going something like 15 stops, connecting to another subway line going 14 stops or so, and then catching a taxi (up) and a bus (down), but it was very much worth it. You may have heard the Buddhism is a peaceful religion. Well. 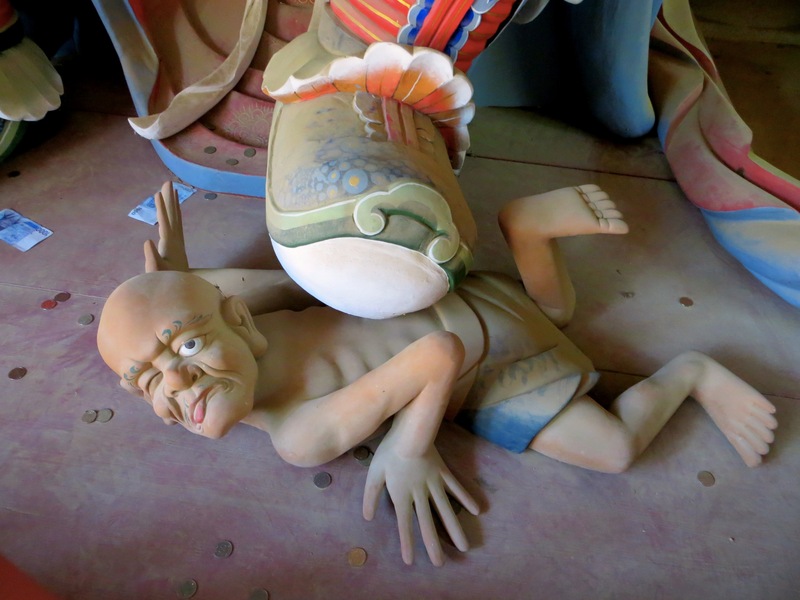 This was at the bottom of a statue in the temple, with some huge god or other trampling this poor guy. Doesn’t look very calm and centered to me.